In “Aging Voices,” we speak to Colorado seniors whose voices have changed, their directors, and a professor who believes that singing when you're older is good for you. Listen to the episode here. John Ahlenius, 75, says that singing "The Music Man" with the theater group at ClermontPark retirement community has been beneficial. Fellow cast member Trudy VanderVeen is a lifelong singer. But at age 85, she knows her voice has changed. “And I don’t know what the change is but I know I can hear myself singing differently than I used to sing," VanderVeen says. "That’s because I’m old now." Silvertones Choir director Mike Krueger acknowledged that as his singers get older, it's tougher: their lung capacity decreases and their voice range shrinks a bit. But to overcome that, Krueger says that the singers focus more on their bodies. “We spend a good 20 minutes on our warm up and our stretch exercises," Krueger says. 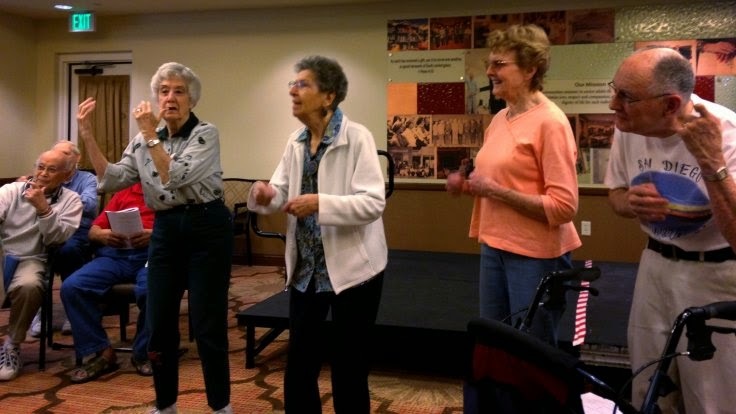 Professor Julene Johnson of the University of California San Francisco says the effort is worth it since singing could actually help seniors stay healthier. Catch the episode here and find more information on the VoiceBox page of the Colorado Public Radio website.